Most people will agree that the earlier in the design process the easier it is to incorporate sustainable elements. Daylight is probably the prime example of this situation: it is easy to add glazing in the beginning, but much harder to find extra space/money for glazing later in the design process. The difficult question to answer is how much glazing do I need to have when I start? And, more importantly, how can I figure out how much I need quickly? While there are various methods to determine the amount of glazing to provide daylighting, such as digital and physical modeling, applying simple equations early may be the most effective to develop a quick starting point. One equation that is particularly effective is the Daylight Factor Equation. A good starting point for the DF is 2%. For reference DF is defined at the ratio between light level outside and the light level inside. For example if the light level outside was 1000 f.c. at 2% the daylight factor inside would be 20 f.c. But you say “unlike you, I don’t like math.” That’s ok, just create a simple model in Revit and let schedules do the math for you! 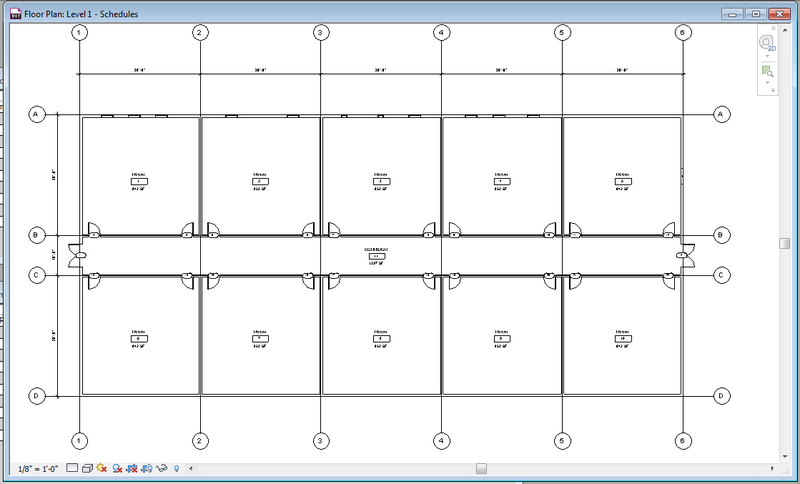 I have created a schedule that can be applied to simple Revit models and auto generate the amount of glazing that is a good starting point. The schedule will show you the glazing you have and the glazing you should have on a room by room basis. See images below. Applying simple equations is a starting point that helps later in the process when more detailed modeling is applied as the design develops. If your interested in working with these schedules, equation, or have other questions about this early analysis feel free to leave comments! Great job showing how to leverage the inherent data in your model!